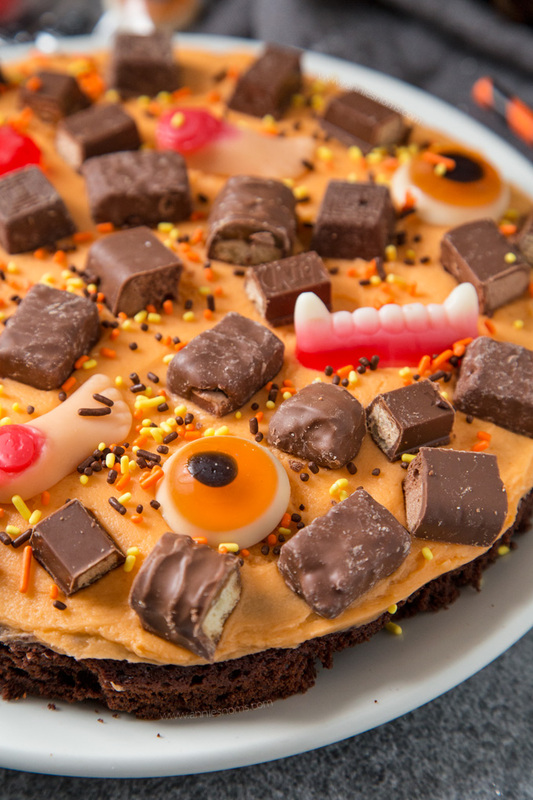 A thick and chewy brownie topped with creamy buttercream and leftover Halloween sweets. 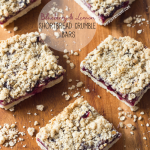 Fun to make and super delicious! Are you bored of Halloween yet? 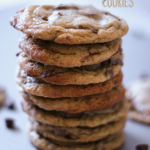 I feel like it’s not a big enough thing here, so I go all out to create fun, tasty desserts for you to enjoy! This is my final Halloween recipe for this year, I normally like to do a couple of weeks of recipes, but life happened and that’s not how things worked out this year, so I’ve had to cram them all into one week! 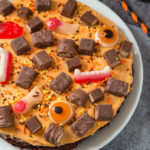 With this recipe, you can either make it beforehand or wait until after Halloween when you have a ton of leftover chocolate/sweets; then you don’t have to make a special trip to get chocolate for the top of this pizza! When you’re a food blogger, you get used to buying and making things beforehand, so we’ll probably still end up with loads of leftovers as I bought too much haha!! I used my favourite brownie recipe for this brownie pizza; I’ve made these brownies for years and they’re everyone’s favourites. I make them with cocoa powder and melted chocolate and even though I’ve tried other brownie recipes, I always, always come back to this one! I baked the pizza in a 9 inch round pan as I suddenly realised while mixing the batter that I didn’t have a pizza plate! You can make this in a 9 or 10 inch flat bottomed round pan, a pie plate or an actual pizza tray if you’re more organised than me! To top the pizza, I made my super creamy and smooth buttercream frosting and added a little orange food colouring. After spreading it over the top of the brownie I then went wild with chopped up chocolate bars and some random gory sweets I had. Fancy a jelly foot anyone? Preheat oven to 180C/350F and spray a 9 or 10 inch pizza tray or other flat bottomed round dish. Place butter and chocolate pieces into a heat proof bowl and place in the microwave in 20 second increments, stirring in between each one, until all the butter and chocolate is melted and smooth. Leave to one side. Place sugar, eggs and vanilla extract into a large bowl and whisk until well combined and the mixture is a little frothy. 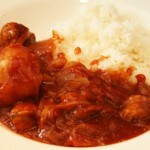 Place the salt, baking powder, flour and cocoa powder into a small bowl and mix briefly to combine. Pour the slightly cooled melted chocolate into the sugar and egg mixture and whisk until well combined. Tip in the flour mixture and fold gently until there are no lumps of flour and everything is combined. Don’t go mad and beat the mixture though. Tip the brownie batter into your prepared dish and smooth into a level layer with the back of a spoon/spatula. Place in the oven for 22-28 minutes, until slightly risen, the top looks matte and only a few crumbs come out when you stick a skewer into the centre. You want the brownie to be ever so slightly under done, if you wait until the skewer comes out completely clean, the brownie will be overdone and tough when cooled. Leave to cool completely before removing from baking dish/tray and placing on a plate. To make frosting: Place the butter, icing sugar, vanilla and salt into a large bowl and start to mix with a hand mixer on low. Once the icing sugar starts to combine, turn the speed up and mix until you can’t see any icing sugar, (mixture probably won’t be light and fluffy at this stage) then add the milk 1tbsp at a time, mixing in between each addition until you have a thick and creamy frosting. 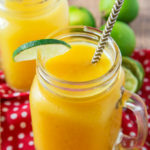 Add in orange food colouring a little at a time and mix in between additions until you have desired colour. I used a Wilton gel colour and needed very little colour. Spoon the frosting into the centre of the brownie pizza and then use a small angled spatula to spread and smooth the frosting over the top of the brownie. 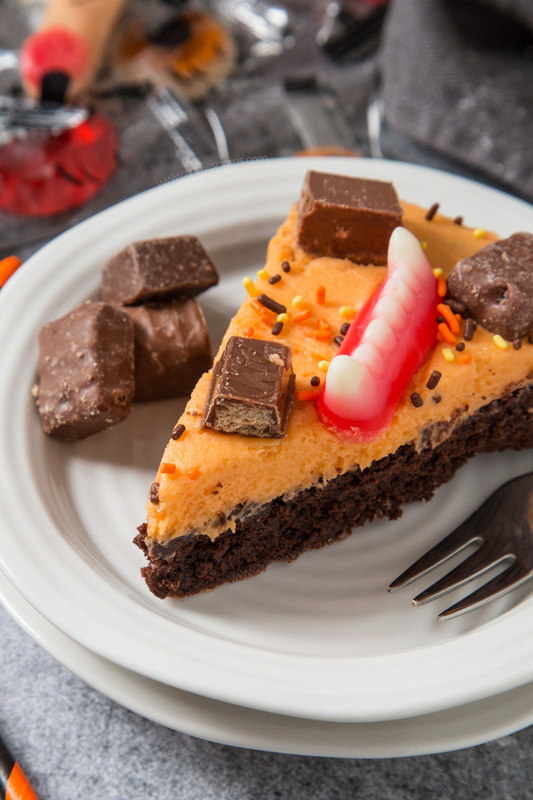 To decorate: randomly place Halloween sweets and chopped up chocolate bars all over the top. Slice into wedges and enjoy! Halloween Brownie Pizza will keep covered, at room temperature for 3 days, or in the fridge for 5 days. I would have Halloween sweet trust issues after an experience with an exploding sweet too! 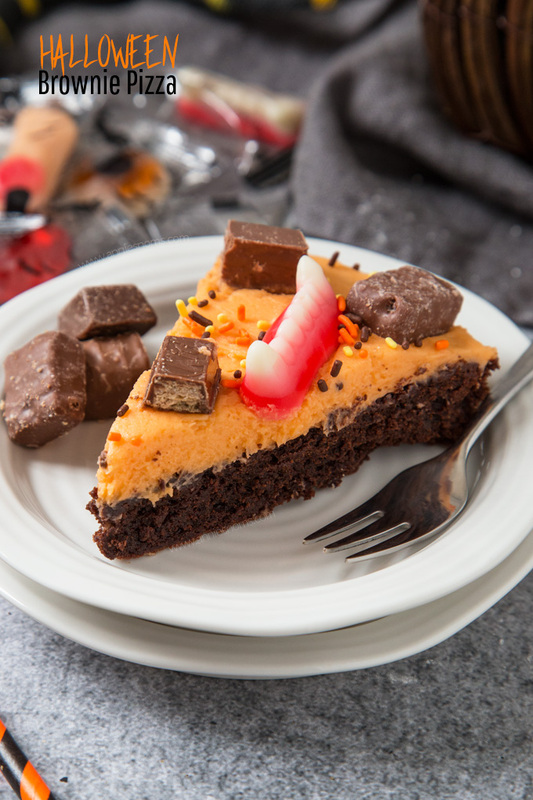 Love your Halloween Brownie Pizza, especially with the yummy orange topping. And what fun with the Halloween sweets! So adorable and a great way to use up Halloween candy. Congratulations! Your post was my feature pick from my Commenters at #WonderfulWednesday this week. Visit me on Tuesday evening and to see your feature and pick up your badge! All hosts choose their own features so be sure to return to my blog. I invite you to leave more links to be shared and commented upon. 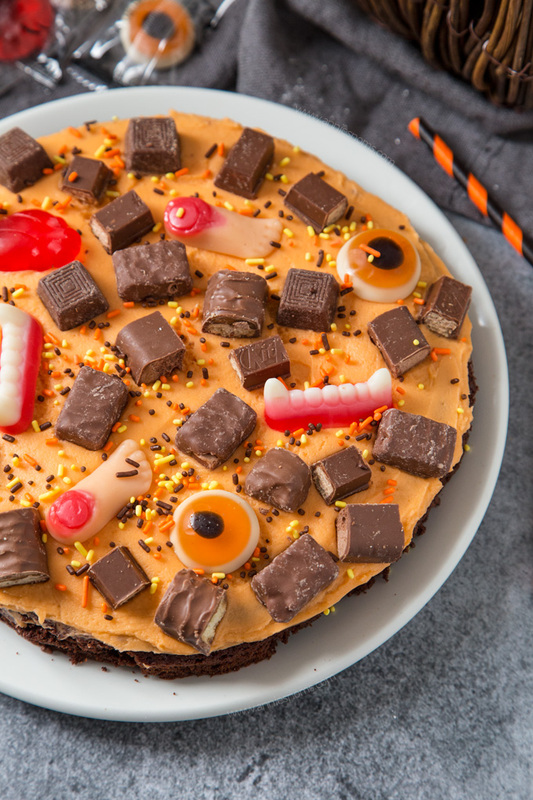 I just pinned your awesome Halloween Brownie Pizza. Thanks so much for sharing with us at Full Plate Thursday and come back soon!